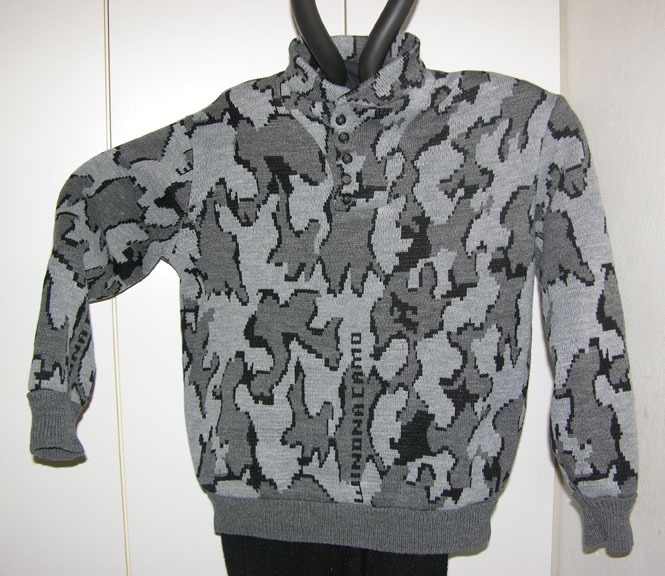 Winona Camo Classic Fatique Sweater with V Tab Button Neck Front, set in sleeves and 1 x 1 Rib trims at cuffs and waist. 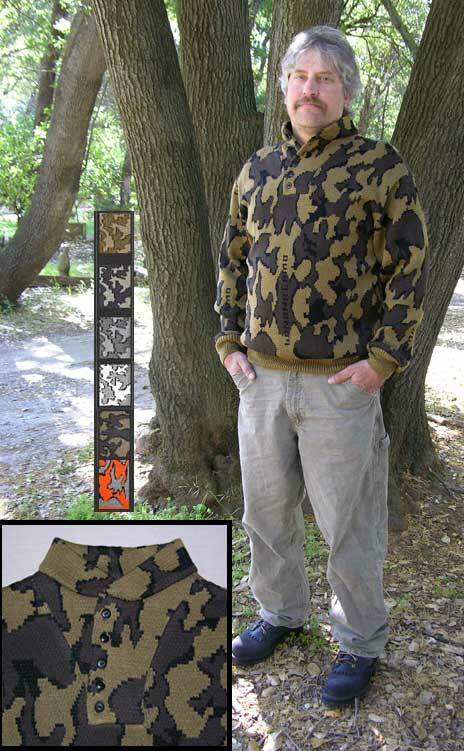 This popular camouflage sweater body style is a favorite by both men and women. V Tab front neck has 5 buttons with a stand up collar. Wear it openor button it all the way up to keep that neck snug and warm! This photo is a size large sweater finished at 48" chest. (model has a 43.5" chest). So if you like a looser fit sweater, order 6" larger then your actual chest measurement. See Sizing tips below. Fiber: 100% Acrylic (Classic) This is a lighter sweater which is perfect for those early season hunts or milder temperatures or just casual wear. Machine Wash Cold Water/Gentle you can dry low heat in the dryer or lay flat to dry if you prefer. Double Bed Jacquard Fabric (no yarn floats on the inside of garment). Each sweater is individually hand loomed and assembled. It is NOT a mass produced item. We offer this sweater under 'special order' so that you can select your size and color way to meet your hunting surroundings! 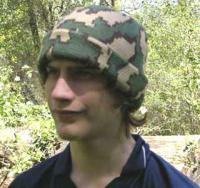 or if it is just a 'style statement' for you to wear for casual wear. Please allow two weeks to have this sweater especially knit for you. We will email you with an estimate of the shipping date or you can contact us if you have special needs. Remember it is first come first serve, and we get very busy starting in Sept. so please get your order in before then. 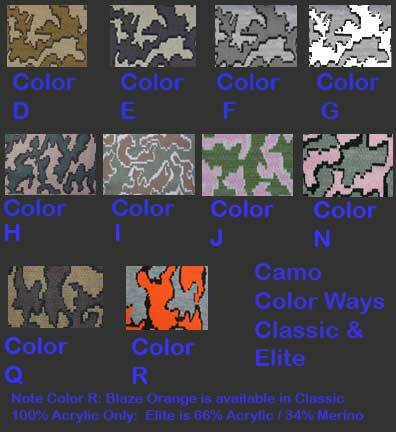 there are 3 choices for the Rib Trim color for each colorway:Color 1 is the first color listed in the camo color way mocha Color 2 is the 2nd color listed in our Camo color way - the smaller Shadow color: Black in our photo, or Color 3: the third color listed in each Camo color way, bark brown in our photo. 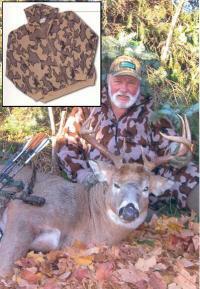 The image is shown with Color 1 Mocha rib trim in the Q Camo color way. The sleeve measurement is taken from Center Back, down the shoulder and with arm slightly bent, to the wrist. If you wish to have the body or sleeve length changed for your size, please state your desired body and sleeve length under comments when you place your order. We try to complete these Custom Orders within two weeks, if there is a waiting line, we will email you with an estimate of time. XSmall 30"-32" 36" 26" 31"
Small 34"-36" 40" 27" 32"
Medium 38"-40" 44" 28" 33"
Large 42"-44" 48" 29" 34"
XLarge 46"-48" 52" 30" 35"
2XLarge 50"-52" 56" 31" 36"
3XLarge 54"-56" 60" 32" 37"
If you like a Fitted Style: add 2 inches to your finished chest measurement and select closest size from chart. If you like a Standard Style: add 4 inches to your finished chest measurement and select closest size from chart. If you like a Oversize Style: add 6 inches to your finished chest measurement and select closest size from chart. After more than 30 years of 'Custom Sizing Clients', These measurements were selected as the Standard Sizes for the Pullover Style Sweater. If you are buying this as a gift, the standard sizes are based on Industry Standards. If you are unsure of what size you want, measure a knit sweater style garment that you own that has a similiar body shape and sweater weight and use that as your finished measurement guide. Remember to allow two weeks to have this special order camouflage sweater jacket knit especially for you! If your sizes differ from our sizing chart, please add your changes in the comments box. Also contact me in Customer service (the contact us link) to let me know of your special needs. First Come First Serve. 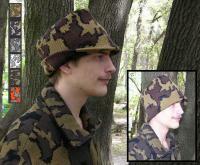 "A Knit Winona Camo Elite Cardigan Jacket ~ choose color & Size ~ merino acrylic blend"